Golf tees have been made with a variety of materials over the years. When you plant the golf tee into the ground, you don't think how they were made or where they originated from. But the reality is golf tees have been around since the middle ages. They've been made by a variety of materials and are often a forgotten component of a successful golf game. In the late 13th century in Holland, golf, called kolfspel, was played by hitting a ball into a series of targets. For elevation, the "tee" used was a tuitje, a small pile of sand that elevated the ball to help the golfer hit the ball. In late 1899, George Grant patented a golf tee that helped to elevate the ball. The Grant tee was made of a wooden peg with a concave piece of rubber to hold the ball. This tee helped the golfer to hit the ball longer by allowing the golfer's club to hit under the ball. The Reddy Tee was invented by inventor William Lowell in 1921. The tee was a wood tee and painted with a red top to be easily visible. Eventually, the tee was made in a variety of styles and materials. In 1924, the tee was patented by the Nieblo Manufacturing Company and made of celluloid, a type of plastic. 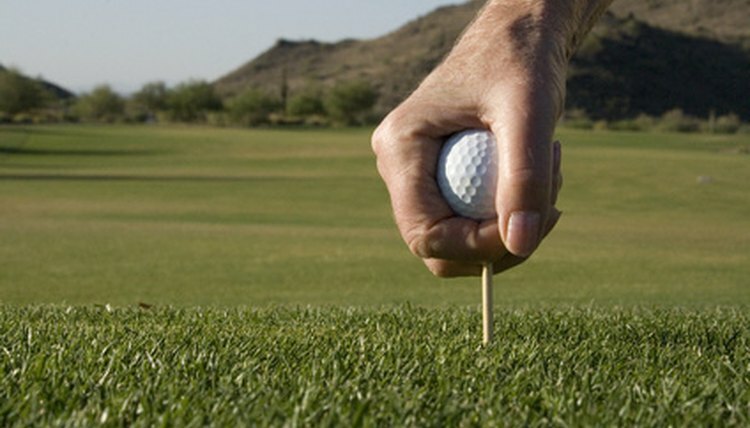 Since the advent of the golf tee in the 18th and 19th centuries, tees have been created from plastic or wood. The primary wood tee is made of red cedar, found in the eastern United States. Plastic tees are also used. The plastic tees add rubber or glue filler to provide flexibility and be less prone to break. Tees are coated with colors for look and to protect them from the weather elements. In the late 20th century, biodegradable tees have been provided to the public. Examples of these biodegradable tees includes animal byproducts and corn derivative. Both of these tees degrade automatically over time. The corn tee can be broken down by water. These biodegradable tees help to promote green environmental efforts on the golf course. How Are Golf Balls Made? What Is the Longest Legal Driver Length? How Are Golf Tees Made? What Is the Butter Knife of Golf?